Colorado U.S. Sens. 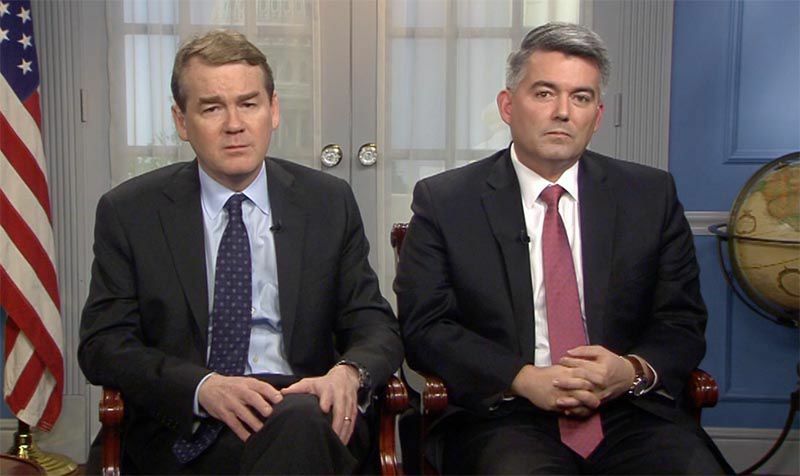 Cory Gardner and Michael Bennet introduced immigration legislation Wednesday that includes a path to citizenship for certain young immigrants and funding for President Donald Trump's border wall. "This amendment is a reasonable solution to break through Washington gridlock and provide a compromise for Dreamers who are counting on us in Colorado and around the country," Bennet, a Democrat, said in a statement. He added that the measure is the "result of each side accepting some things they don't fully agree with." Gardner pitched the proposal as a compromise to resolve the stalemated debate over immigration that has consumed the Senate this week. "This legislation addresses DACA and border security, and we are urging members on both sides of the aisle that want a solution to support our bipartisan approach to addressing our flawed immigration system," the Yuma Republican said in a statement. The measure shares elements with one proposed a month ago by Gardner, Bennet and four other senators that was rejected by Trump. The legislation introduced Wednesday would establish a 12-year pathway to citizenship for Dreamers, immigrants brought to the United States as children who meet a number of conditions. It also allocates $25 billion in border-security funding over 10 years, including a down payment on a border wall with Mexico, as well as increased funding for immigration judges and a permanent authorization for an e-Verify program, used by employers to check immigration status. But it doesn't contain limitations on legal immigration - including restrictions on family-based immigration and an end to the diversity visa lottery - Trump has called priorities, but that Democrats say could prevent legislation from getting enough support to pass the Senate. The president on Tuesday got behind a bill proposed by Iowa Republican Chuck Grassley that includes those provisions while also giving as many as 1.8 million so-called Dreamers a chance to become citizens. Bennet and Gardner said Wednesday they're committed to working toward a solution. "There are many children who came to this country without documentation and we need to allow them the opportunity to remain here lawfully," Gardner said. "Coloradans expect Senator Bennet and I to work together and that's exactly what we have done." Bennet said they plan to "continue to work with our colleagues to advance this measure and take another step forward in fixing our broken immigration system."